How to realize your DIY macerated oil and what are the benefits for your skin? Thanks to the mucilage of hibiscus flowers, this macerated oil will have an amazing moisturizing and soothing benefit on your skin. These flowers will nicely tint your DIY creams and lotions, and will also have a beautiful radient complexion effect as well as an anti-aging benefit by activating your skin’s collagene production. A macerated oil is the result of plants, flowers or roots brewsing into a specific oil. After 6 weeks the macerate oil is filtred and the oil will be used pure as a body oil, or used in DIY cosemetic recipes as a oil ingredient. To accelerate the macerating process you can lay your jar in the sun or heat it in a bain-marie( use a pan filled with 3 inches of water and dip a smaller pan with your oily mixture to heat smowly without boiling or burning). However my choice is always to avoid bain marie and to let the time brewse slowly and deeply all the active ingredients into the oil. In your recycled jar (use one with a watertight lid), fill for a third (1/3) with dryed hibiscus flowers (I insiste, it is much better to use dried flowers, it won’t get mouldy), than fill with oil. I usually choose macadamia oil (which is the case for hibiscus). Macadamia oil is a stable oil which is not sensitive to oxidation, it is also a great oil to use as a cosmetic basis. Leave it for 6 weeks of maceration and shake it each day. After these 6 weeks, filter. 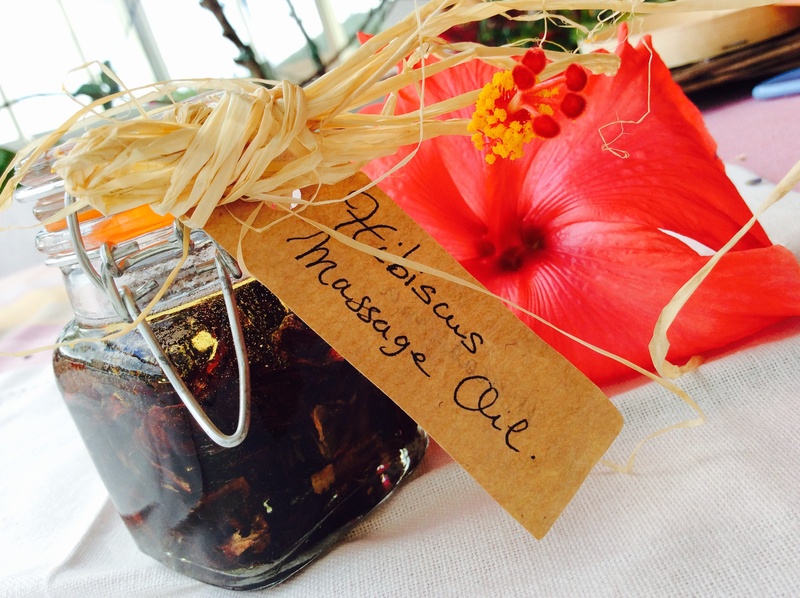 You can now use your pink macerated oil filled with all the natural benefits of hibiscus flowers. 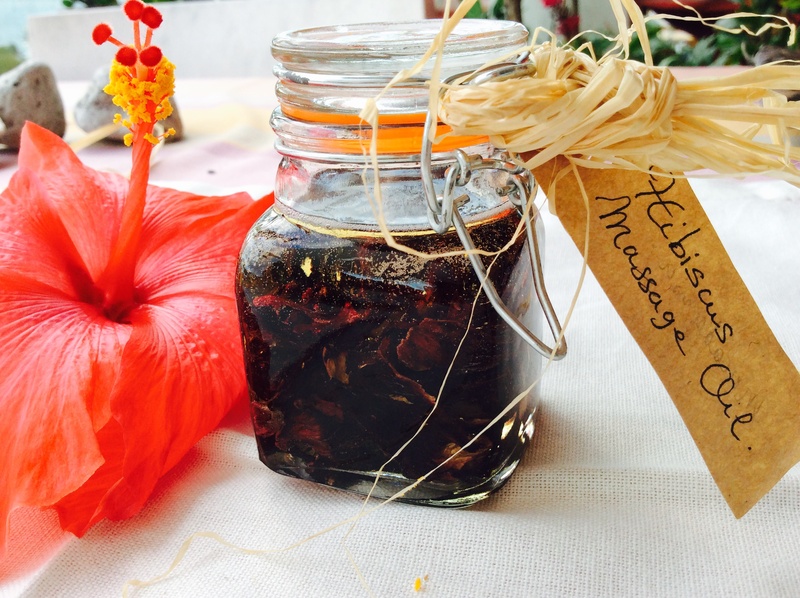 Hibiscus Petals are a great addition to your skincare regimen. They have been used in Indian and Ayurvedic skin & haircare recipes for centuries. Hibiscus is a natural emollient and has a high percentage of Vitamin C. “Because of its powerful natural Botox type effect. Hibiscus contains a firming agent, which not only has a calming effect on skin, but also smoothes out wrinkles, giving a person healthy, youthful skin.” Hibiscus also promotes healthy hair/scalp and shiny hair. I will come up with some nice DIY cosmetics recipes soon…so….don’t hesitate to follow my blog!!! Enjoy and be beautiful …naturally! !